It was the first time that the Kawasaki 500 KLE , submitted at the end of ' 90 at the Cologne motor show, It was deployed at the start of the most important African rally. 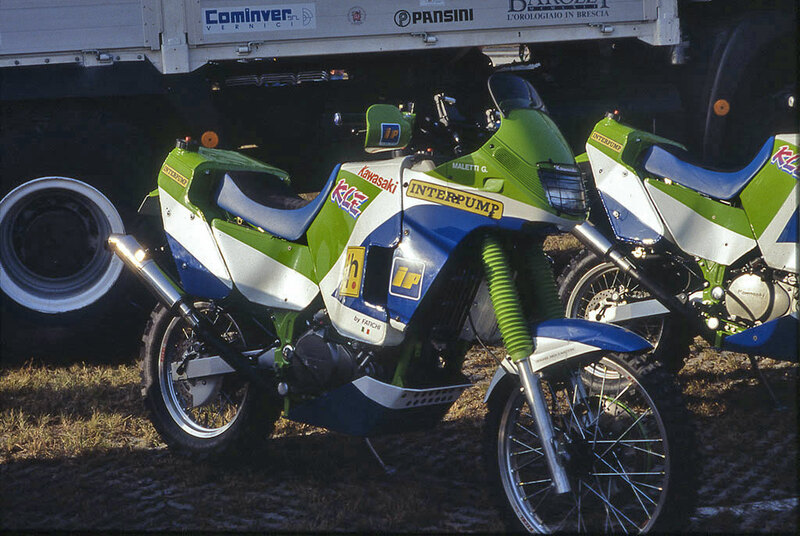 Then there were the unknowns, but the Kawasaki-Italy had worked with care trying to best prepare the challenging Marathon, Although the decision to compete in the marathon category had imposed to remain as close as possible to the production model. 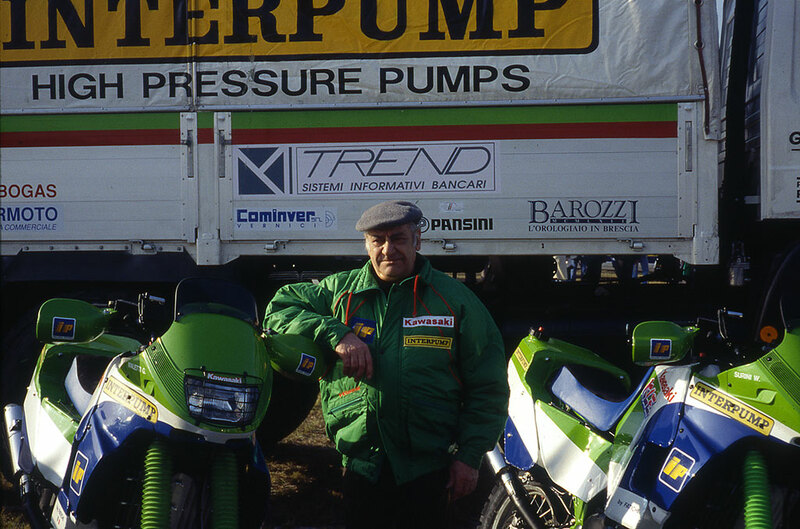 The two KLE of Surini and Maletti had preserved their standard engine, a four-stroke parallel twin 499 cm3, with double overhead camshafts and four valves per cylinder, few basic features 74 x 58 mm and 6 Marce. 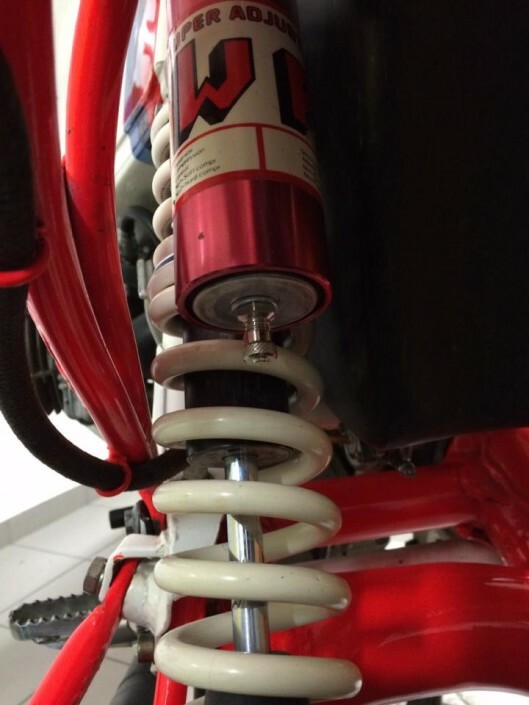 On the frame instead it had been possible to work, because despite the constraint of standard chassis, double cradle steel, the regulation allowed them to intervene on the suspension, provided you keep the original rear linkages and sheaths and stems of this fork series. Totally new body parts instead, with a large front tank and two small rear, total capacity 54 litres of petrol. Motorcycle Kawasaki team management-IP that had as main sponsor the Italiana Petroli, It was entrusted to the TEAM Assomoto: the team of Bruno Birbes was one of the most organized nationally, and had a percentage of pilots brought in to the finish in Dakar 79%. As means of assistance had been entrusted to a truck Liaz 154-111 and a car Range Rover 3900. 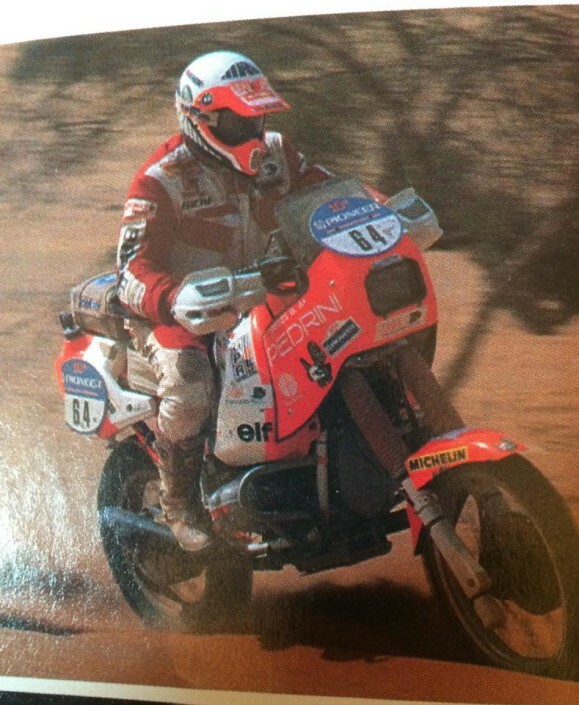 Curious detail, the car was driven by Davide Pollini support fast, President and Chief financial and logistical Assomoto team, He had behind a couple of Dakar motorbike, and a drive in 1991. 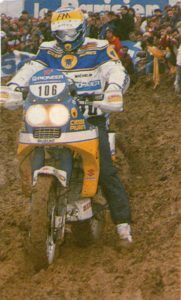 29 GUIDO MALETTI It was one of the first Italians to devote himself to the great African rally, and in 87 was able to obtain a very good 11th place in the Paris-Dakar Reggiano, 33 years, has extensive experience in national enduro; It was factory rider Kawasaki-France in Dakar ' 90 while in the subsequent Edition no longer races. Back in the race with Kawasaki, focuses on the regularity and the ability to be wrong shortly, What are its best qualities. 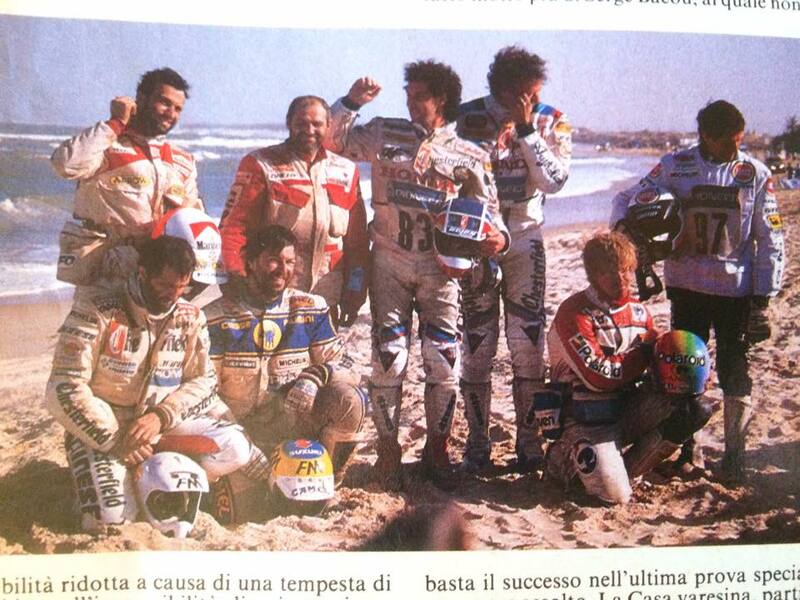 30 WALTER SURINI Clenched teeth and so much effort to accomplish last year his first Dakar. But he made it, and this time he criticized as an official driver of Kawasaki-Italy. 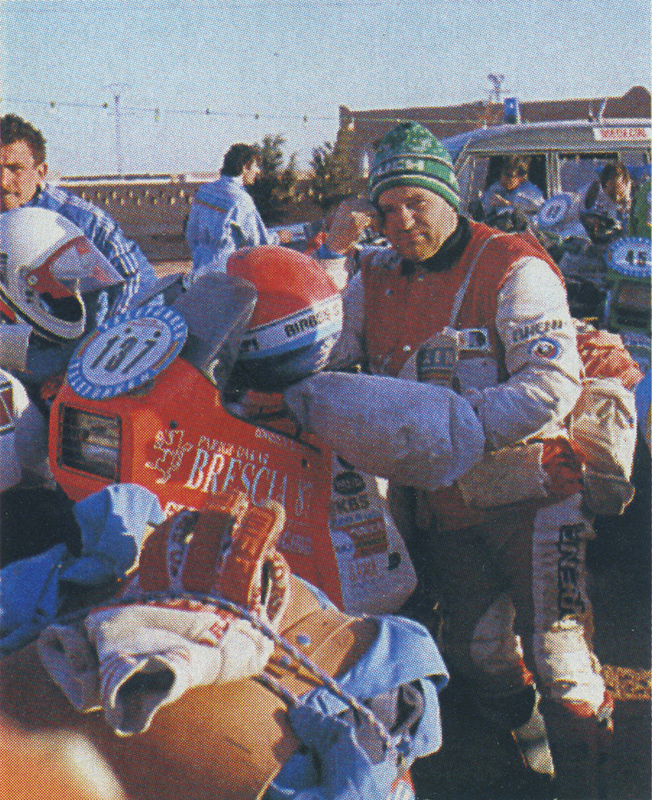 Her experience, however, was not limited to the classic African rally: among its most prestigious results a victory Rally in the Incas ' 88, When managed from private to beat several officers, and good results again in Peru and in Sardinia, In addition to the success in the Rally of the Dominican Republic of the ' 91. 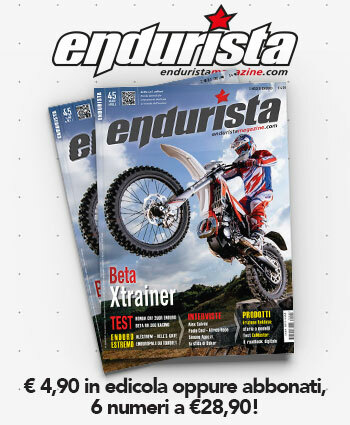 Bergamasco 31, helicopter pilot, She had won several national championships of enduro, endurance and junior. 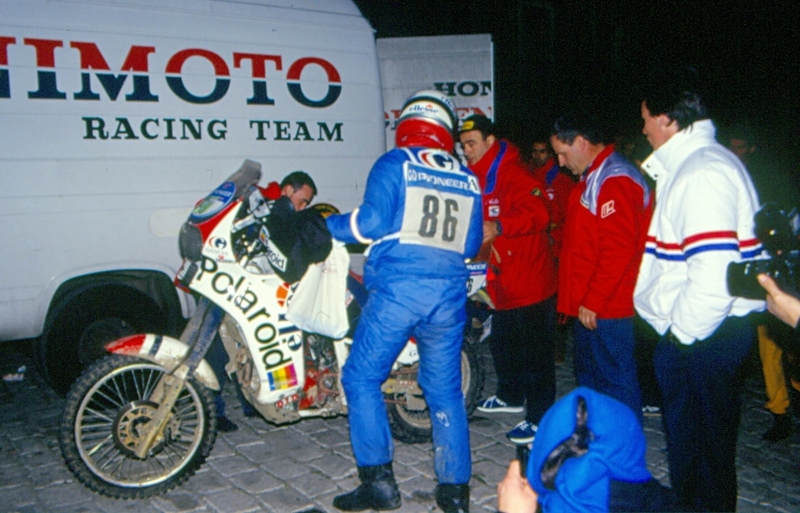 Ed: both drivers behave admirably, ending both the competition, demonstrating the seriousness of the Team and the goodness of the motorcycle driven. 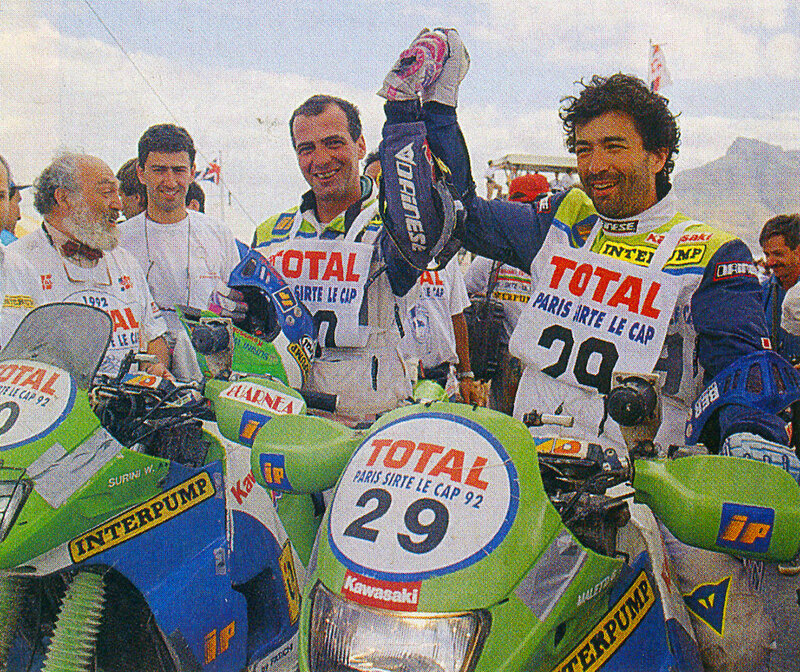 Maletti and 19° 20° Surini concluded respectively and in the absolute (4° and 5° in category Marathon won by Massimo Montebelli). Great satisfaction upon arrival. 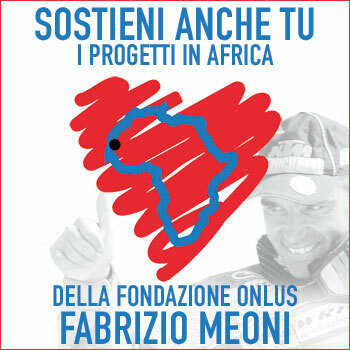 Maletti is winner of the cat. up to 500 CC. Struggling and Charles Edson. 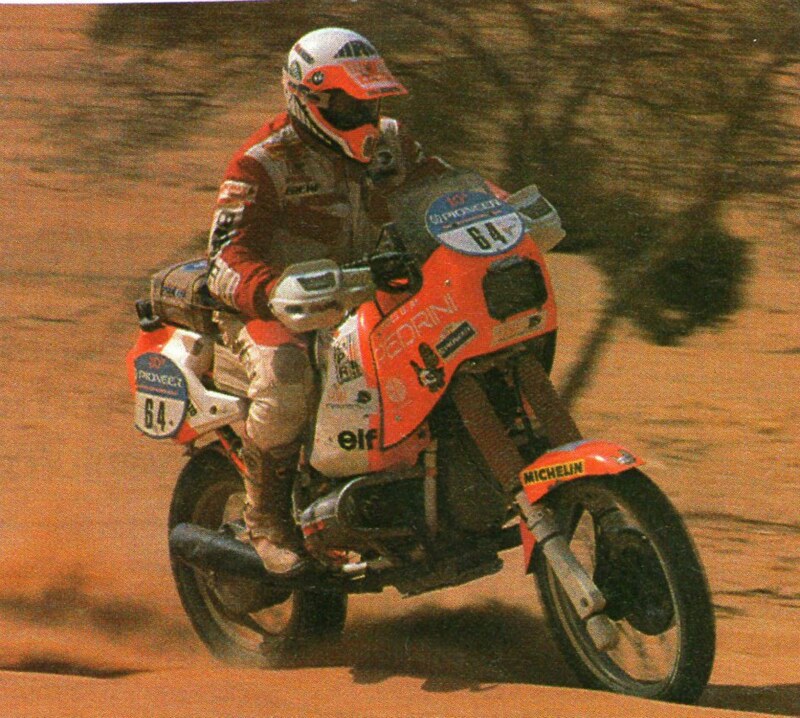 after previous experiences at Pharaons Rally of the editions ' 84 and ' 85, you were made to clear and precise idea of how it was to be a bike able to compete for victory. 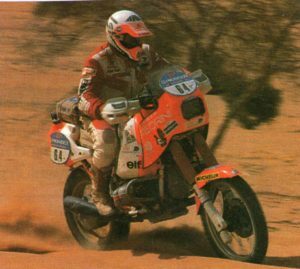 First of all a reliable two-cylinder engine and can guarantee high speed and an indispensable strength on long desert marathons. Obvious so the choice of BMW also considered that Charles Edson, the German House, It was the official dealer for Brescia and province. 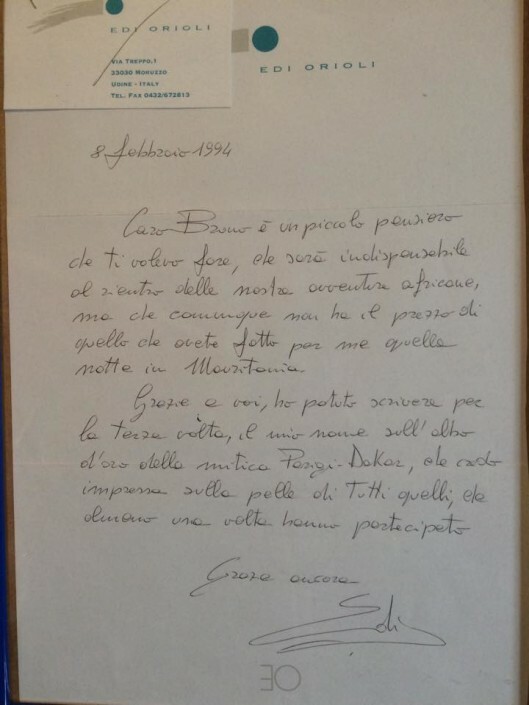 "I had in mind the motorcycle of Rahier» – Silvio begins Struggling – "I wanted to make an equal and if possible improving it. My ideas, After nearly ten months of work, led to this result which I am satisfied». In fact, after almost a year of Saturdays and Sundays stolen from family and rest, the object that came out will satisfy Birbes who after the first tests on the track of Rezzato, He expressed himself in terms very favorable. 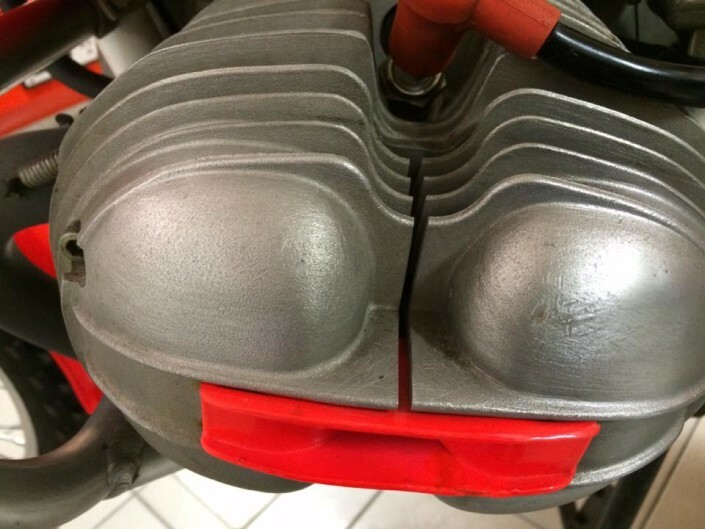 «The motorcycle in principle is valid. but we have yet to perfect the front suspension 'cause. with a full tank of gasoline (60 liters), go to the bottom racing». If we consider that this BMW-Struggling with a full tank of gasoline weighs about 240 kg, almost less official German motorcycle. We can image into their efforts to arrive at such a result. What difficulties have you encountered in the realization of this «monster»? 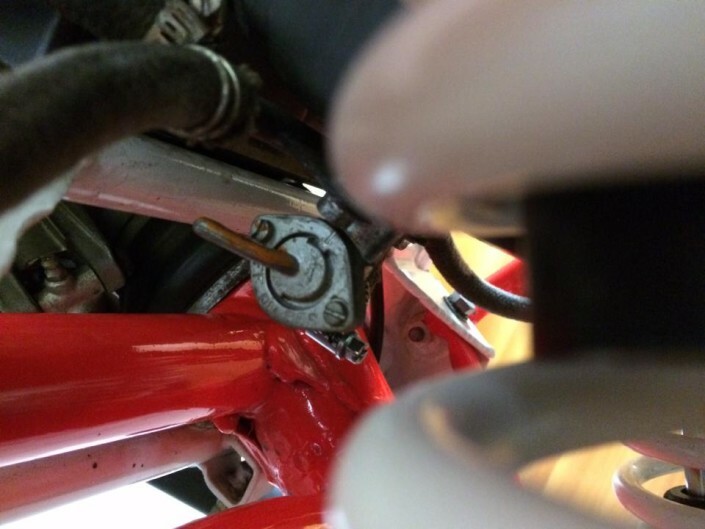 «I had to lengthen the swingarm to nine centimeters by rebuilding so the entire transmission» – meets Struggling – "I have completely redone the back of the frame to allow easy positioning of the spare tank in such a way then you can disassemble the motorcycle without encountering too many difficulties. Now I'm able to intervene on the gear and the transmission without dismantling the Middle». BMW-Struggling will start in early October to Marseille where they will do the ' 86 Edition hallmarks of Rallye des Pharaons. The result of this competition will also depend on the participation in the Paris-Dakar rally which will start on January 1 next. (Ed. Charles Edson arrived 6° in that issue of the Pharaohs). 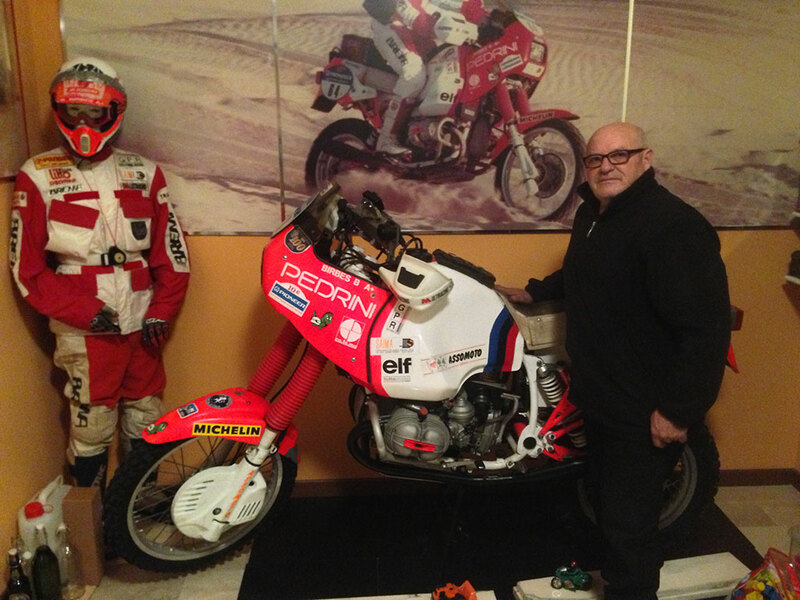 «Subscribe to Dakar» – concludes Charles Edson – ' has already been performed. but the result of the ' Pharaohs ' will influence greatly on our participation. I think I still have the bike suitable for these marathons». We leave Birbes and Struggling to hundreds of questions that fans and onlookers turn to them to know "why and how" of their realization. 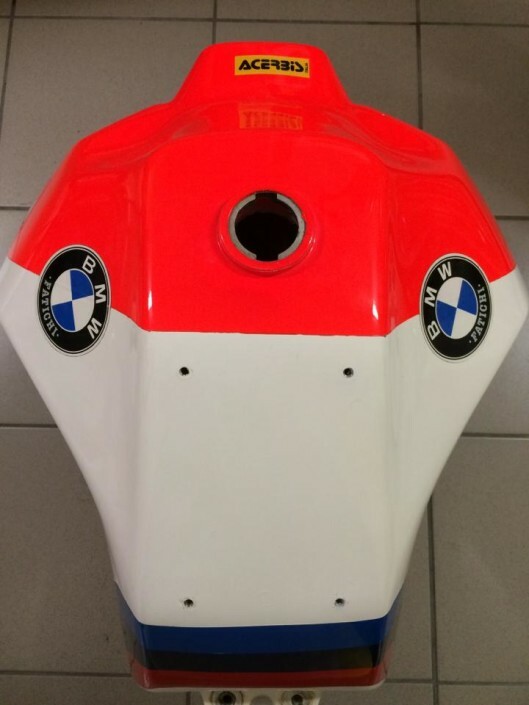 The similarity with the official BMW motorcycles is truly remarkable, but the bike though is the result solely of ideas and of Silvio Struggling. We Thank David Baez (proud owner of the bike) for the material provided to make this post. BMW in race trim of the era. 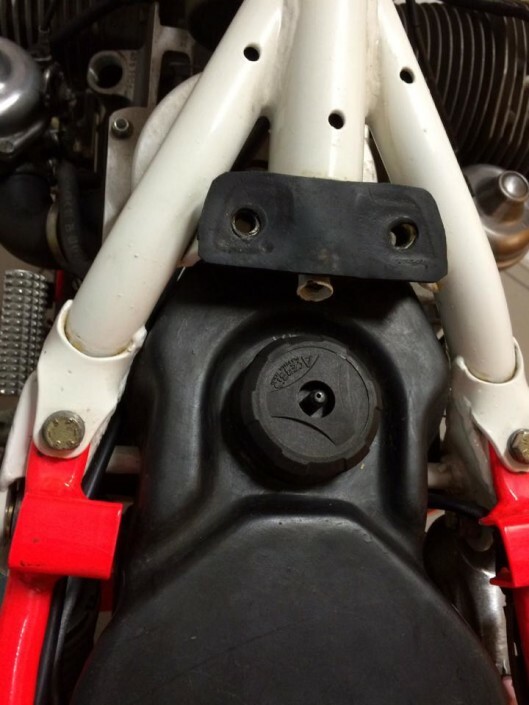 Tap in the rear tank. The other tanks under the saddle from 7,5 litres and under saddle from 1,5 liters. As stated in the certification is a BMW R100 RS frame ASI although significantly modified. Three tanks, the main from 42 litres..
Obviously ended up our games, tells me: «Oh, see that this is one TRUE, is an old-school already, not a wimp like you…». 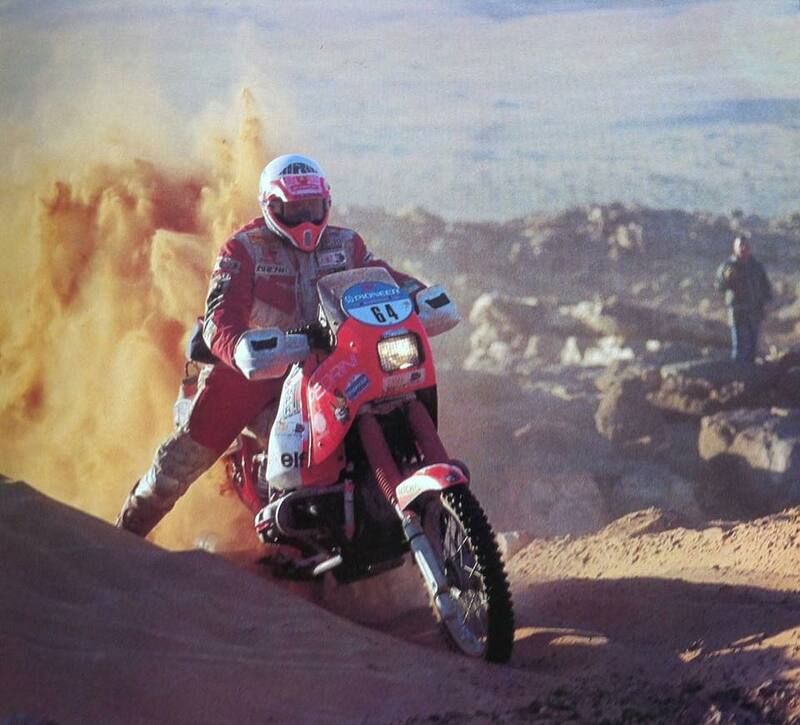 And still: "This has made more than a dozen, among those on motorcycles as a pilot and as an assistance and team manager. Is one of your parts, a Brescia…». Bresciano who, I am a GAL. My wife, my daughter and my dog are bresciane, but that's a separate discussion… So I go ahead and ask him the name, He tells me he is called Charles Edson, Bruno Birbes. But I know him!!! 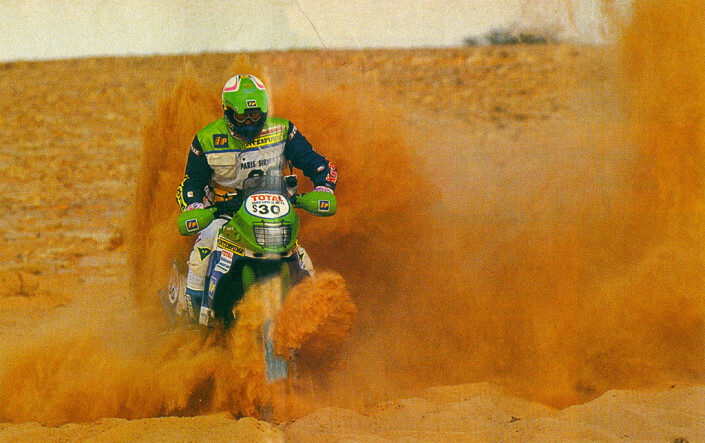 How Many Dakar? What? That Bruno Birbes? Ah, yes, I had heard… Fabio is right, I'm a scoundrel. Yes, but is it possible that every time I meet "" Bruno (Note the article before the name, the bresciana) that always seems to be a docile 65-year-old who likes to picnic with friends still at motorcycle rides… What is, a joke? Whereupon began investigating- King, call a couple of friends and I speak- No one who gives the gas for sale, who got behind in classes ca professional riders with names, played of the Pharaons Rally during the first six. These banks make me angry: is it possible that when you deal with them always seem to newcomers, those who have lived in the hut no yesterday afternoon, then go see below and discover which are dragons that stuff there!? Now let me tell you a little bit of who we are talking about. We're talking about a promising young champion class 1949, doing her first steps with Gali 50, Italjet 50 and Müller 50 in the early ' 60 gymkhanas. 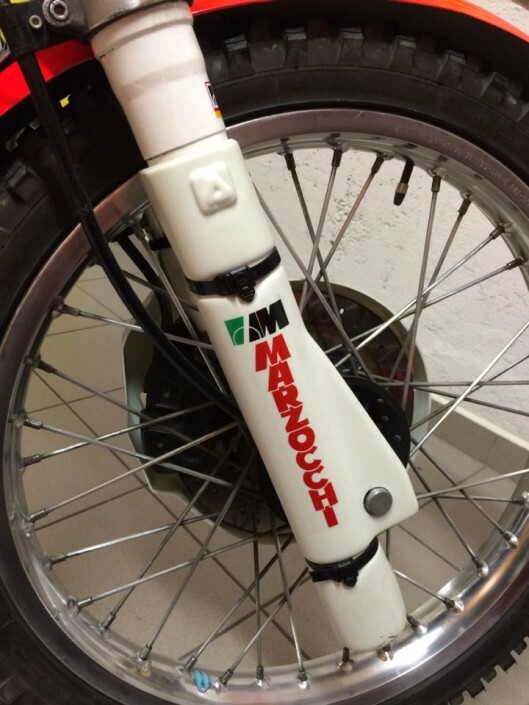 Even in the 1968, the six days of San Pellegrino, won the bronze medal on Müller 50 motorized Zündapp, No at the moment do not buy a Müller 125, Montesa motor, puts it in the hands of the legendary preparer of Borgo San Giacomo, Maestroni (recently deceased), and start the adventure of racing. VA strong little boy, has that Twinkle that makes him stand before, has that sample madness. Thus began to make a name for themselves and friendships begin to arrive and aid. 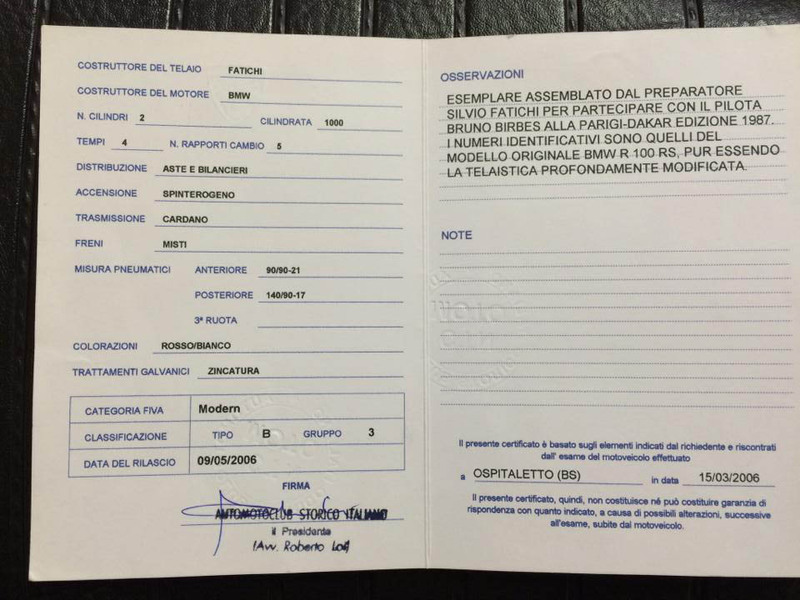 In those years comes the officiality with Puch in regularity and the great encounter with the man of change, Silvio Struggling, at the time assistance workshop Puch and mechanic trainer. 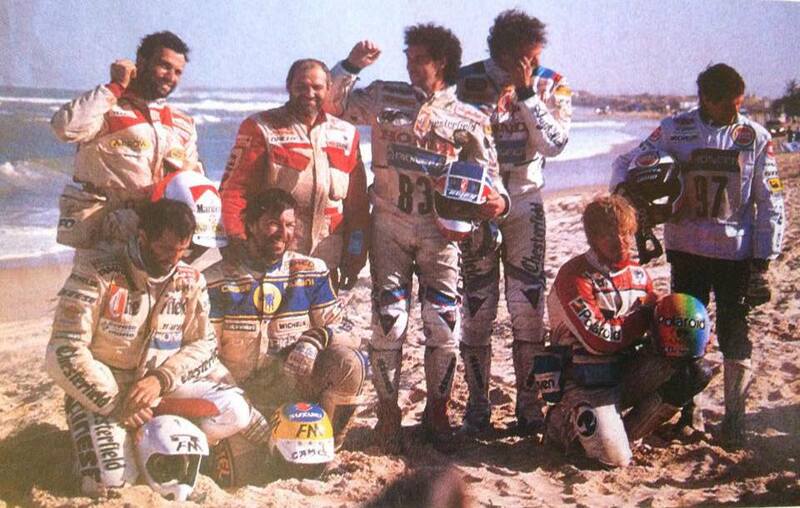 In 1973 Charles Edson joined the official team Fernandez and becomes a pilot Puch in all respects. 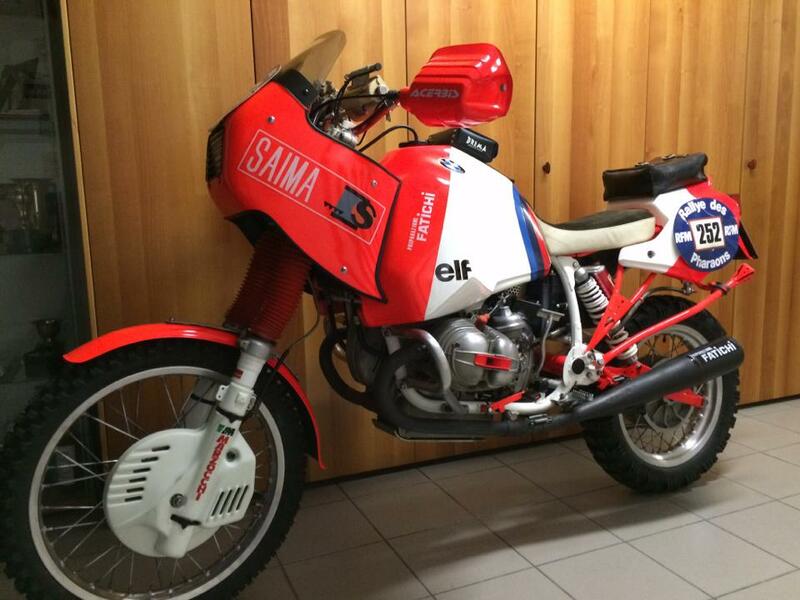 Running with the 180 CC, made to fit the six days of the marches of Camerino 1974, and with the 250 Replica Everest two Carburetors, with which to play the podium end of season rankings in Italian, battling with drivers such as Testori, Nikki t and Ferrari. 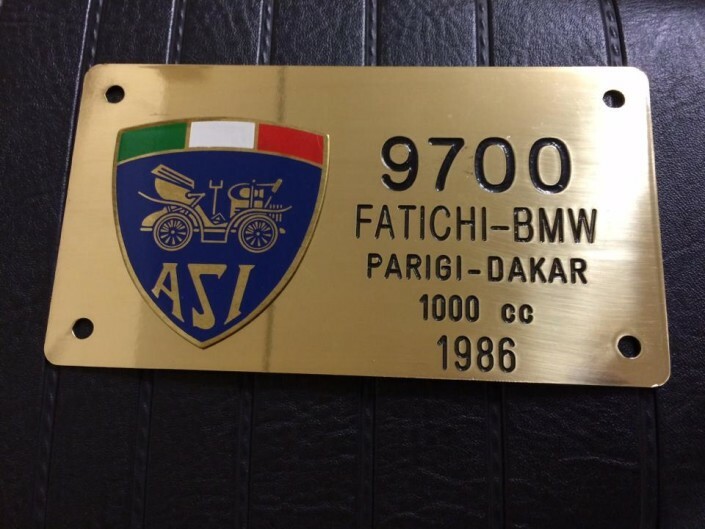 In 1975 try putting my head in place and decides to open a dealership Puch and BMW; takes advantage of the very important figure of Struggling, stop running officially and began a flourishing entrepreneurial career. I use the term "proof" because, Racing- mind talking, the head together she pretended to put it, minor races and devoting himself to open the shutters in the morning. He married the daughter of Struggling, gave him of grandchildren, He sold many beautiful BMW boxer, gentle and quiet, It has streaked straight for a few years. The problem is that under the ashes there was still the volcano turned on: one fine day he woke up, He watched a BMW, He turned to his father-in-law, Struggling, and told him: "How about one and we go to Dakar!». Honda team manager with Orioli and Tade, takes it and makes him understand that his race is over, load it onto the plane in place and bring the bike to Agadez. While he tells me the episode, Bruno has tears in her eyes. The fact is that, Obviously, reorganizes and even create a Team, the Assomoto, with the help of pollen and Girardi determinant (his great friends, two more sick of rally). 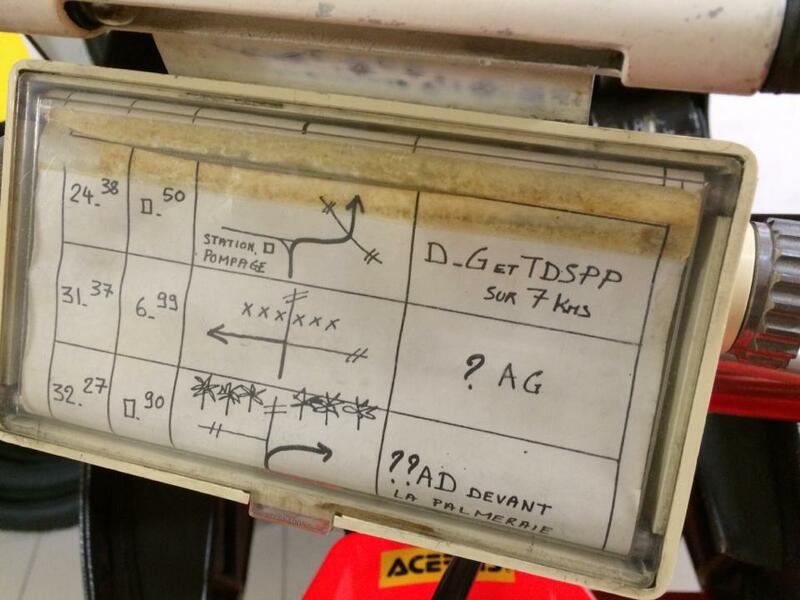 So, After buying a Unimog, PA tone for Dakar 1988. In this edition there is a 1.150 km… is an issue very hard, breaks the Exchange in the second stage and after having towed by Winkler to the finish, It tells that he was out of gas (because otherwise they forfeit) and passes the finish line by turning on the bike with the air pulled by pretending that everything is OK… After breaking the frame under the Steering sleeve, He rides a stage and then the firm; in Bamako changes the engine oil now goes, but eventually arrives and also great. The Rally of the Pharaohs of 88 goes with an XR 600. Very fierce and ready to get a good result, plant a mine than just remembers that after he stopped to give a De Petri… complete darkness until Gauri tells him to sit still that helicopter is coming. Two days in a coma in Cairo. 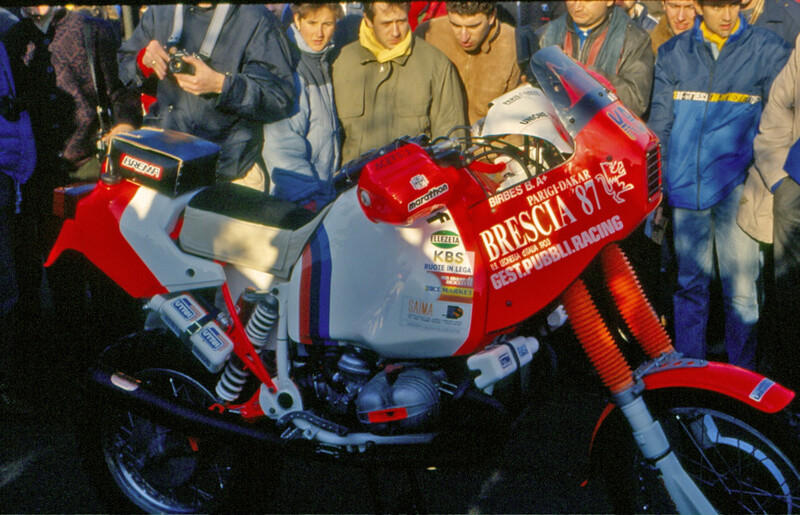 From 1989 just motorcycles, but only to drive. Arrives and he gets run team manager Beppe Cinnamon, also because it's still bagged. 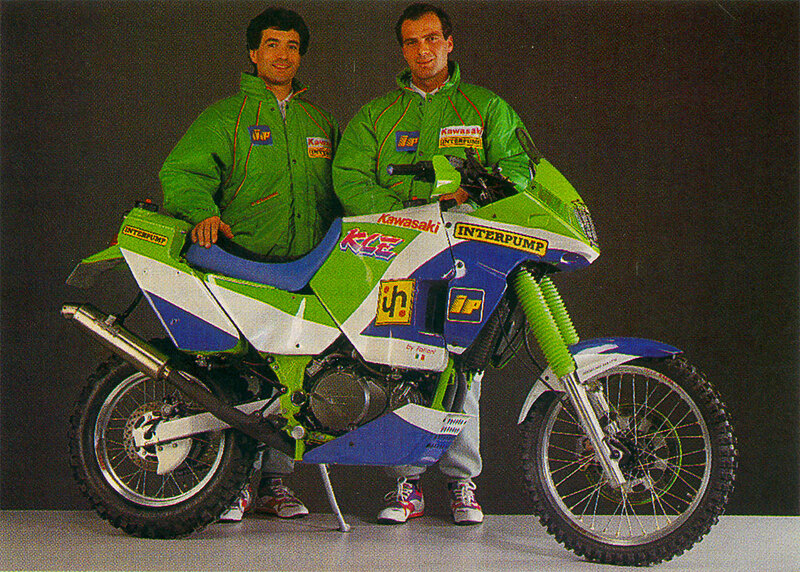 Since ' 90 become official assistance for individuals enrolled in the Dakar and Gilera ' 91 Official Kawasaki Team become even with KLE 500 Twins. Struggling has become a dragon dakariane preparations, and from the 1985 the ' 95 might try something like 25 bike. It is known as a tough character and he knows how to put together a motorbike from the desert, so many rely on "Grandpa". 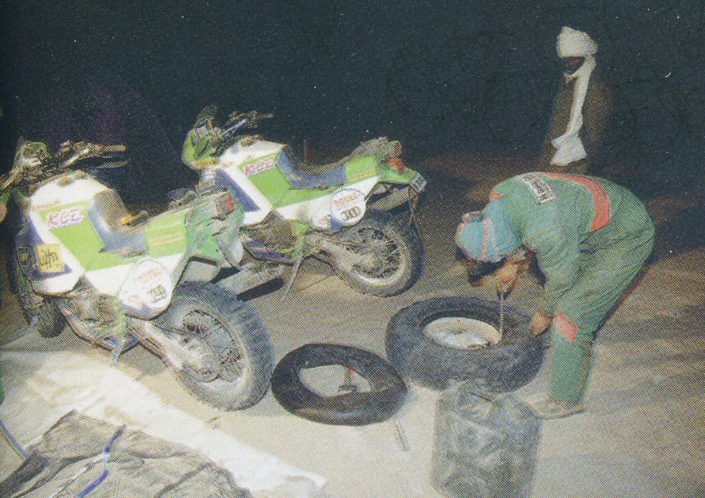 During these years make assistance to various drivers, including Aldo Winkler, and live the adventure of Dakar old-fashioned, the African ones, becoming in effect a major team and recognized as certainty from the Dakar (among the many anecdotes that Bruno tells me I'm struck by the time the arrival of a stage in Mauritania Orioli comes with finished, Marathon stage without assistance; Birbes is there, and with the help of some friends dismounts all in one night, Exchange system and allows the sample to do the next day's stage, get support and finally win his third Dakar). His BMW now keeps it at home on the fourth floor, next to toys grandkids, in front of the desk, close to the photographs. He is a kind of good manners and respectful of the House and sixty of his order, never again will you think that devil from Dakar who always threw myself into the adventure, that capital letter. Among the photos that I find at home by Bruno Birbes, one strikes me as particularly, and so I ask him what he was doing in that picture. 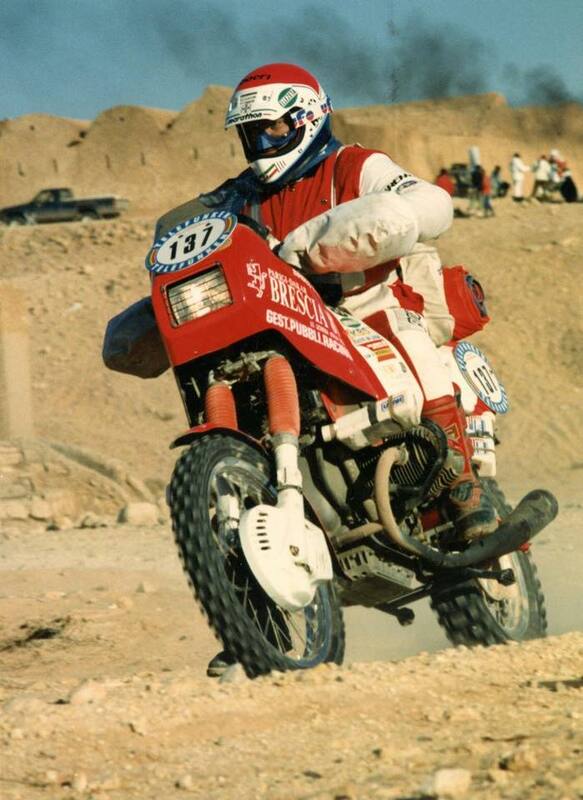 Immediately starts laughing and I'll explain that in an edition of the years ' 90 the Dakar during a layover Aldo Winkler comes with broken arm. Charles Edson, that is his assistance, knows he doesn't have the parts there and the next day must start its pilot. Now, Let me quote the definition of genius that is given in the film Amici Miei: "the genius is fantasy, intuition, glance and execution speed!”. So Birbes you look around with his arm broken arm in hand. There at the side there is a Mauritanian kiosk with the tables and chairs of iron. With making furtive grab a Chair, saw a leg and in the divided into two in the inner canals broken arm; rivets all (Obviously in a serious) and the next day Winkler is broken down… and he finished the race. Boys, I swear I sparkled eyes! The great Silvio Struggling, trainer and creator of the bike. 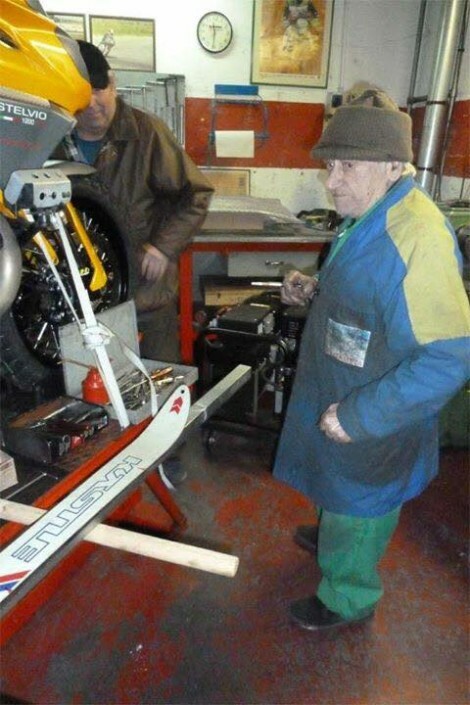 Passed away at the age of 90 years and who never left the workshop.